IBM DB2 Document Manager Version 8.3 is one of the newest members of the IBM Enterprise Content Management portfolio. Document Manager provides a secure and robust platform to manage the complete life cycle of business documents. It helps ensure accurate and up-to-date documents are available on demand. When configured with IBM DB2 Records Manager Version 4.1.2, the Document Manager solution also provide records management capability. 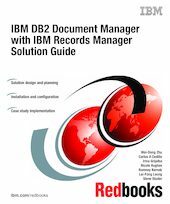 This IBM Redbooks publication provides a general solution guide for Document Manager integrated with Records Manager. This book helps you to plan and design the solution, perform end-to-end product installation and configuration, and implement the solution using a practical case study as an example. The book is logically divided into two parts. The first part focuses on solution overview, concept, and theory. We cover Document Manager design and planning, and Records Manager options design and planning. In addition, we cover overall integrated solution security and system configuration planning. The second part focuses on practical end-to-end solution installation, configuration, implementation, and deployment. We use a case study to show you practical, implementation steps for the solution, including setting up basic and advanced Document Manager features and records declaration options within the solution. This book is intended for IT architects and specialists, who will be responsible for planning, designing, and implementing a Document Manager solution with Records Manager. We recommend using this book in conjunction with existing product manuals.